2. Wash the area around the head under cold running water if you do not want to include the tomalley (liver). Remove the green mustard, innards and the sand tract. 3. Rinse all the lobster under cold running water. 4. Let all of the lobster pieces drain of excess water after you rinse them and pat dry with a paper towel. 5. Mix the flour and cornstarch in a shallow bowl, and lightly dredge the lobster pieces. Dredge only the exposed meat to seal in the juices. 6. At this point, many restaurants deep fry the lobster in a large wok (fry pan) to quickly seal in the juices. This process only takes 20 seconds or so, but for home cooking, we recommend to use a smaller pot and fry in batches. This flash fry method cooks the lobster about 70% of the way through, enhances the lobster flavor, produces a rich colour, and seals in the juices while preventing the tender meat from overcooking. 7. Heat 2 cups of oil in a small pot to about 180 degrees, place the lobsters into the pot for about 10 seconds. Remove, and place on kitchen paper to drain. The shells should turn bright red almost instantly. 8. To finish the dish, start with a clean wok over high heat. Add 2 tablespoons oil to the wok, along with the ginger; Let the ginger fry for about 30 seconds, until fragrant. 9. Add the white portions of the scallions and the lobster. Stir fry on very high setting for 20 seconds. 10. Pour the Shaoxing wine around the perimeter of the wok and immediately cover it. Let it cook for about 2 minutes. This step infuses or “bakes” the lobster with the ginger and scallion flavor. 11. Uncover the wok and add the soy sauce, sesame oil, sugar, white pepper, and the rest of the scallions. Stir fry for another minute. You can add a couple tablespoons of water if the wok is too dry. 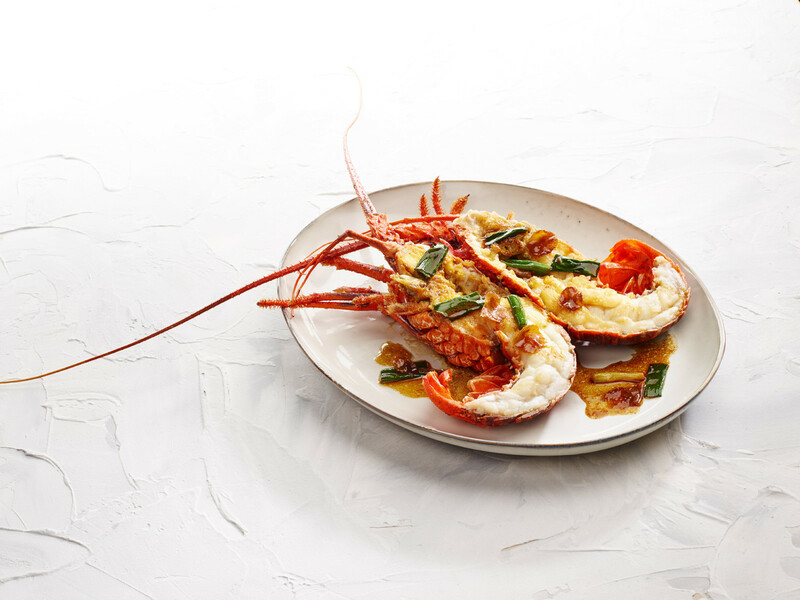 It is personal preference whether you wish to include the tomalley in your dish – it is the lobster’s liver and is used in many Asian dishes to increase the flavour.